In recent months we heard news reports of China’s brutal escalation of its aggressive policies towards the Uyghur Muslims living in East Turkistan, the good country on the East of the Muslim land. It did not settle since it was seized by Mao Zedong the Chinese Communist regime in 1949 who annexed it to the Chinese territory after the killing of more than one million Uygur Muslims and the demolition of 25 thousand mosques. The latest but not last news of the investigation reported by the Atlantic Magazine and other media such as the BBC and Al-Jazeera, that China is holding in the province of East Turkistan nearly a million Muslims in detention camps! The investigation quoted experts from the United Nations, that the goal of the camps is to brainwash the Uyghur Muslims in the region, in order to abandon Islam, and it is well known that China is one of the most open anti-Islam country, the Intelligence agazine has published China’s announcement that Islam is infectious disease and must be treated In every way, even through torture and murder. The crimes in East Turkistan are indescribable. Our brothers there are bound and hanged on gallows, cement and concrete is poured into their mouths suffocating them, our sisters are prevented from conceiving and giving birth, Men are castrated. The kafir Chinese regime place a kafir Chinese man in every Muslim house to spy on them under the pretext of their education of the Chinese culture, disregarding their privacy and sanctities. Muslims are prevented from fasting on the Blessed Ramadhan. Muslims are forced to renounce Islam under threat of psychological and physical torture, according to Human Rights Watch. The Chinese authorities claim that they are forced to confront the triad of evil: terrorism and extremist ideology and call for secession, as the BBC reported. Under these false slogans the authorities carries out various repressive practices. East Turkistan was an integral part of the Islamic state. China did not dare to annex it until after the Ottoman Khilafah (Caliphate) was destroyed and the Muslim lands were divided into an odd number of 50 statelets. What makes China dare to occupy East Turkestan? 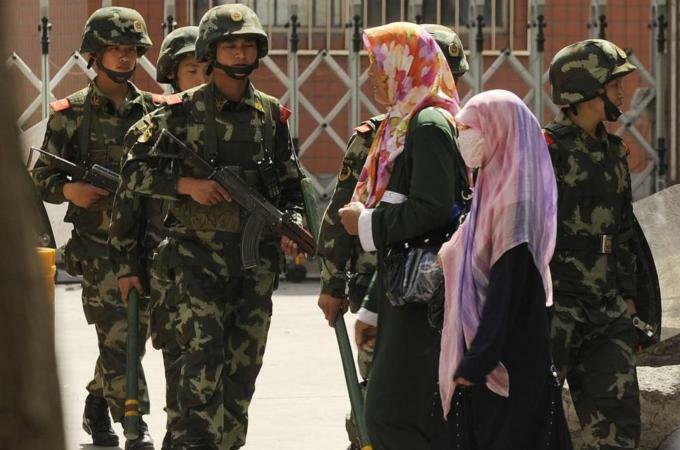 What makes China dare to oppress and harass Uyghur Muslims? Is not that because they lost the shepherd who cares for their affairs, they lost the just Imam whom they fight behind and are protected by him, they lost the Khalifah Rashid (guided Caliph) who responds to their cries, screams and whining? Rise and support your brothers and sisters, the Uyghur Muslims and all oppressed Muslims in the East and West of the earth; by the hard work with Hizb ut Tahrir to establish the second Khilafah Rashida (guided Caliphate) state on the method of Prophethood, which will liberate the usurped Muslims lands, and will free the necks of the Muslims from the tyranny of colonialism in all its forms, and will punish those who oppressed them and will strike with the iron hand of anyone who even think of attacking the sanctities of Islam and Muslims. We in the Central Media Office of Hizb ut Tahrir announce the launch of a large campaign entitled “China’s War Against Islam in East Turkestan Will be Ended Only by the Khilafah Rashidah (the Righteous Caliphate)” to support your Muslim brothers and sisters in East Turkestan, so participate and share its materials as widely as possible. Maybe our call will reach the ears of our sons from the people of power and protection, and they may respond to the callers of Allah and support His Deen to establish the state of Haq (Truth), the State of the Messenger of Allah ﷺ, the state of the second Khilafah Rashida (guided Caliphate) on the method of Prophethood.